A very interesting turn of events has apparently taken place with Buakaw Por Pramuk in Japan. There had been confirmations and denials floating around the Por Pramuk camp for a long time about Buakaw’s future in K-1 MAX. At one point Por Pramuk’s management assured everyone that Buakaw would be returning to the kickboxing promotion giant of Japan’s stable. While at the same time there had been rumors that Buakaw was finished in Japan as a whole and would take all of his fights internationally in the future out of Japan. Buakaw was a unique entity in the K-1 ranks in that in his time away from K-1 MAX he fought full rules Muay Thai rules bouts and often. It looks like it is official now that Buakaw will at last be making a long awaited return to Japan but not under the promotional banner of K-1 MAX but instead Shootboxing. 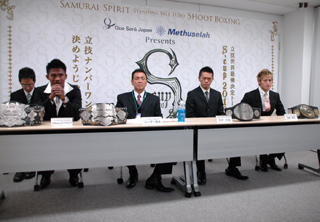 On October 15th Shootboxing held a press conference in Japan for its Global Tournament Shootboxing S-Cup. Hiroki Shishido was present at the press conference. In their previous bout at K-1 MAX, Buakaw quickly KOed Shishido in K-1 MAX 2006. Shishido said about having a great debt to Buakaw and if Buakaw gets the final spot in the tournament he wants to return the favor. Buakaw replied that Shishido is a star fighter in Shootboxing so the fight would be gladly accepted if Buakaw is in the tournament. Buakaw will now be joining fellow former K-1 MAX champion Andy Souwer in Shootboxing. Both have apparently chosen against K-1 MAX who’s parent company still have not paid all the non-Japanese competitors who fought on their promotions. And an 8th unconfirmed fighter yet to be named. ~ by fatsoking on November 8, 2010.